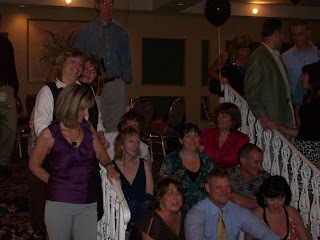 Well, this weekend was my 25th year reunion. I didn't really want to go but I'm glad I did. About a third of us showed up (not a very organized picture above, I'm hoping for a better one). It was nice to see so many familiar faces, so may that haven't changed a bit (darn them) and a few who I didn't recognize at all. All in all it was fun catching up and finding who was where and doing what. Nearly done with my editing (re-editing) of Forever Home and I think I've made some huge improvements on it, thanks to my latest rejection letter on it. When I'm finished I'll move along to That Kind Of Magic and do the same. I haven't decided if I'm going to retry with Kensington or go for Samhain with it. After I get rid of the passives it may be ready for the big time. Kids are beginning their first full week of summer break. And it's going to rain all week. Go figure. I'm hoping they'll get out for a lot of walks. Justin has a scooter he's learning to ride so he'll need many trips to the bike path. Good exercise! I need it. My step daughter headed down to South Carolina for the summer so it'll be a little emptier around home. Now back to editing. I'm only about 20 pages away from being done!! The instructions: Just copy the list of 100 accomplishments, highlight the ones you've achieved in bold, and elaborate as desired. Be forewarned, this is a long meme: a marathon to read; just about as long to write. 001. Started my own blog. Actually have started about 3 blogs. 002. Slept under the stars. Loved building makeshift camps out in the backyard, usually without much of a roof. 003. Played in a band. I was that kid in the band that played all the miscellaneous instruments like the triangle and cowbell. In parades I played the cymbals. 004. Visited Hawaii. I wish. 005. Watched a meteor shower. We were lucky to live in the country so there were no lights to block the night sky. Love meteor showers. 006. Given more than I can afford to charity. 007. Been to DisneyWorld/Land. Been to Disney Land once (I cried on the Alice In Wonderland Ride and Disney World twice. Love the Haunted Mansion. 008. Climbed a mountain. We live right next to the second (or possibly most) most climbed mountain in the world, Monadnock. No car roads, just hiking trails. Fantastic view! 009. Held a praying mantis. 010. Sung a solo. When I was in college I was part of a traveling children's theater group. Luckily they didn't care that I couldn't sing very well. I was one heck of a puppeteer though. 013. Watched lightning at sea. 014. Taught myself an art from scratch. Used to draw horse heads and people heads all the time. Never could do bodies, though. 015. Adopted a child. Only furry ones. 017. Walked to the top of the Statue of Liberty. Can people do that anymore? Stood right in her crown. 018. Grown my own vegetables. First time is this year! 019. Seen the Mona Lisa in France. 020. Slept on an overnight train. 021. Had a pillow fight. Many, many times. 024. Built a snow fort. I lived in Minnestoa for the first 11 years of my life. I don't think I could've gotten away with not building one every year. 025. Held a lamb. Does a baby goat count? 026. Gone skinny dipping. Well, only half skinny dipping. 028. Ridden in a gondola in Venice. 030. Watched a sunrise or a sunset. Many, many, many times. 031. Hit a home run. 032. Been on a cruise. Been on several. One to the Bahamas and several from Portland Maine to Yarmouth Nova Scotia. 033. Seen Niagara Falls in person. 034. Visited the birthplace of my ancestors. Well, sort of. My family comes from Bath and northern England and Wales. I visited London once. So that's close. Never been to Wales though. That's a dream of mine. 035. Seen an Amish community. 036. Taught myself a new language. 037. Had enough money to be satisfied. 038. Had a tatoo removed. 039. Spit off a bridge. 042. Seen Old Faithful geyser erupt. 043. Bought a stranger a meal at a restaurant. 045. Walked on a beach by moonlight. Very romantic. 046. Been transported in an ambulance. 047. Had my portrait painted. Well, I had my caricature drawn. 048. Gone deep sea fishing. 049. Been to the Sistine Chapel in person. 050. Been to the top of the Eiffel Tower in Paris. 051. Gone scuba diving or snorkeling. I snorkled while in the Bahamas. I loved it. I'd love to try it again. 052. Kissed in the rain. Actually as romantic as walking on the beach in the moonlight. 053. Played in the mud. only as a kid. 054. Gone to a drive-in theater. yes, several times. And when I was a teen I sometimes even watched the movie. 055. Been in a movie. No, but my neighborhood was in the movie Sensation of Sight. 056. Visited the Great Wall of China. 057. Started a business. Kind of. I used to hand paint boxes and sell them at craft fairs. 058. Taken a martial arts class. 060. Served at a soup kitchen. 061. Sold Girl Scout cookies. 063. Got flowers for no reason. 064. Donated blood, platelets, or plasma. I'm O+, so the blood bank loves me. 066. Visited a Nazi concentration camp site. 068. Flown in a helicopter. 070. Visited the Lincoln Memorial. 071. Eaten caviar. wasted on me. 073. Stood in Times Square. 075. Been fired from a job. 076. Seen the Changing of the Guard in London. Fantastic, especially for a 19 year old girl who's sucker for a man in uniform ON A HORSE. 078. Been on a speeding motorcycle. Didn't like it much. For many reasons. 079. Seen the Grand Canyon in person. 080. Published a book. Thank goodness I can say yes. 085. Read the entire Bible. No, but I'd like to. 086. Visited the White House. 087. Killed and prepared an animal for eating. Trout and hornpout. Couldn't do more than that. 088. Had chickenpox. I was in the first grade. Stayed home for a week and that week was followed by a week vacation. It was terrific. 090. Overcome a physical disability. 091. Met someone famous. A couple of the members of Diamond Rio and a politian who ran for president recently. 092. Joined a book club. yup, but bad idea. 093. Lost a loved one. My brother 11 years ago next month, my aunt nearly 10 years ago and my father almost 2 years ago. 094. Had a baby. Three of them! 095. Seen the Alamo in person. 096. Swam in the Great Salt Lake. And stubbed my toe there. 097. Been involved in a law suit. yes, but don't like talking about it. It involved a vicious landlord. 098. Owned a cell phone. 099. Been stung by a bee. 100. Ridden an elephant. Not the most comfortable beasts to ride. I'd rather ride a horse. Future author, future pilot for American Airlines and future smoke jumper. What a mix. Can't believe our dad let us get this close. Can you imagine if we scratched it? 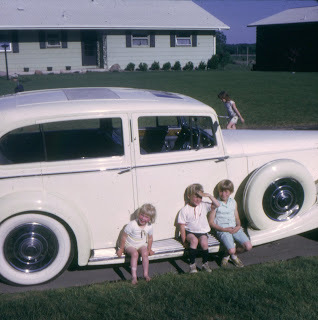 Good thing my brother didn't get his BB gun until after this car was gone! 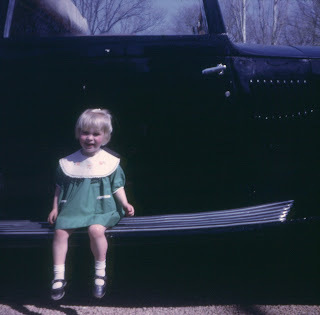 Me sitting on the running board of, I think, my favorite Rolls. This is the Daimler that we took on the ill-fated trip out west. That's my Dad holding up, I believe the "Booby Prize" Flag. I think it was given to the car with the most problems. Lucky us. No the model did not come with the car. No clue who she is, but this was my favorite of all the cars we had. The house, also not ours, was in Minneapolis on one of the lakes. We were not a wealthy family. My dad just had a love of classic cars. 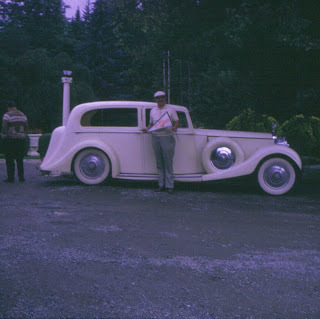 This was one of our Rolls Royces. Diane tagged me. I don't get tagged very often, so I hope I'm doing this right. I have the following questions to answer. Instead of tagging 4 more people, I'll let anyone who wants to be tagged go for it. Well, another publisher was heard from. L&L Dreamspell emailed me today saying they're passing for now on Forever Home. One reason was my overuse of the sentence weakening "was". And I thought I was a "that" queen. Guess I'm now a "was" queen. The other reason was that the storyline wasn't unique enough. Too many stories that are similar out there at the moment. So, here I sit and wonder what to do with the evil "was"es. (was's? wuzzes?) If I take a sentence: "Galloping across the prairie was the way she wanted to live her life." how do I get rid of that annoying evil little "was"? Oh, I'm sure there are plenty of ways to do it and when I sit down and really go over this manuscript with a fine toothed comb I'll come up with ways to fix them. I'll get right on that tomorrow, even if means sacraficing some "new" writing time. And then the next question popped into my head: Are the rest of my manuscripts just as overused? Have the storylines been done to death? How can I make them so unique editors are going to be clamoring all over me to be the first to get that fantastic fresh idea. And is there such a thing as "fresh ideas" out there? So, it's time for me to take stock of what I have, what I'm doing. No, I'm not going to bail on the writing business. Absolutely not. This is a challenge to me, figuring my way around this. 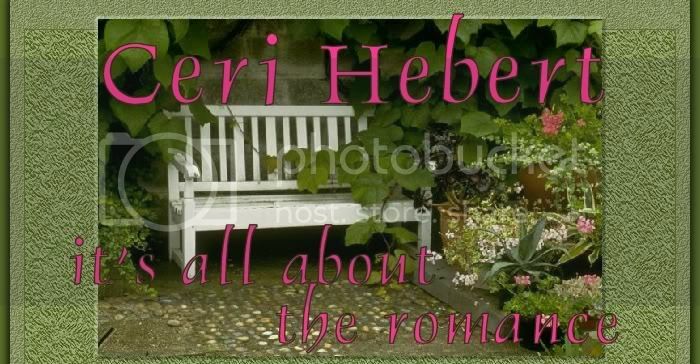 I really have to thank the editor at L&L Dreamspell for letting me know just why she wasn't requesting a full on this book. It's probably the biggest help of all. Because without the feedback how can an author grow and improve? Oh, and I just sent out a query to Avon for Forever Home. So I best get my fingers going on the keyboard and do battle with the Evil Wuzzes.